Tejaprana Resort & Spa is snuggly nestled in the lush jungles of the Petanu river valley in Tegallalang, a mere 4 kilometers from the lively cultural town of Ubud. 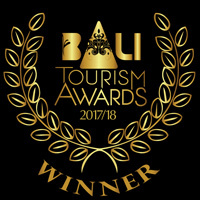 Designed by an award winning Balinese architect renown for his ability in creating serene spaces immersed with Balinese Taksu, or life quintessence, let Tejaprana Resort & Spa be your space to clear mind and spirit. Start the day basking in the morning sun as it breaks the jungle treetop of the river valley across the resort. 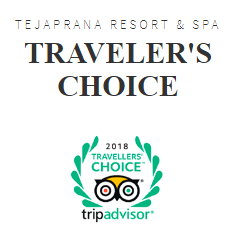 Tejaprana Resort & Spa comprises 28 cozily furnished villas, all facing east allowing you to take full advantage of the warmth and benefits of the morning sun. Each villa is complemented with a gazebo, an infinity plunge pool and an outdoor natural stone bathtub bringing you yet closer to the Balinese landscape embracing the resort. Tejaprana Resort and Spa is designed by Arte Architect and Associates. Indulge your palate in Aruna Restaurant with a selection of delectable favorite local and international dishes passionately prepared with the freshest ingredients. Pamper yourself to a rejuvenating spa treatment or soothing massage in Chatraka Spa. Each of our three treatment rooms offers a perfectly framed view of the tranquil natural scenery. For a more contemporary atmosphere visit Oja Lounge, be it for coffee, tea or cocktails. A selection of books and other reading material are available as is an internet station. For the first time in the country’s history, the president, the vice president, and members of the People’s Consultative Assembly (MPR), will be elected on the same day with over 190 million eligible voters. Egg paintings at the resort for you and your family from 18 to 21 April 2019. A memory to be brought home for this special day. Founded in 2015, the Ubud Food Festival Presented by ABC is three days of cross-cultural culinary discovery with Indonesian food as the star. In its five years it has grown into Indonesia’s leading culinary event. Saraswati is a celebration dedicated to the goddess of knowledge. The children, who pray and bring offerings to the temple of their school, mainly celebrate it. The Balinese also pay homage to the goddess and books by sprinkling holy water. Pagerwesi is a ceremony dedicated to the spiritual strengthening and development of individuals’ forces against evil. On this occasion, the prayers and offerings aim at saving humanity, keeping evil away from men and ancestors. Held annually, Bali Art Festival was first held in 1979 by the late Professor Ida Bagus Mantra. The main purpose of this festival is to preserve Balinese art, music, and literature, gaining a strong base for national identity.